Karting is one of the most fun, exhilerating, cost effective and professionally run forms of motorsport in Australia. If you would like to join in on the experience, this page outlines how you can begin Karting today! Click here to start the application process of becoming a club member! Once you are a club member you will need a licence. The licence comes with a KA Karting Manual, which outlines all the rules, regulations and operations of the KA. A KA Licence also deals with insurance while racing. The karting industry in Australia is always keen to assist newcomers in entering and enjoying the sport. The many kart shops around Australia will be able to assist you with not only purchasing a kart, but also helping you maintain it and acquire the neccesary tools and equipment. Most kart shops will also offer a range of safety gear – that is, full face helmets, race suits, racing boots, gloves and other optional safety gear such as padded rib vests and neck braces. As well as kart shops, motorsport race gear shops carry ranges of karting gear and even motorcycle shops can be good for things like helmets and wet weather driving gear. Karting is a friendly, family-orientated sport and karters young and old are always happy to help out newcomers. Make sure you ask lots of questions of members of your kart club, state association and local kart shop. 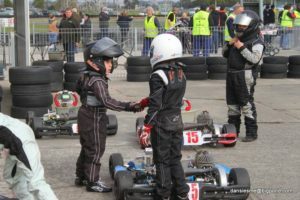 It is often a good idea to plan your first trip to the kart track with your kart with someone you know so that they can help you with any questions you may have. Also, while at the circuit feel free to ask other competitors any questions. So often then friends you make in karting will be friends for life.